Of all passes through the Alps. The Great St. Bernard is by far the most interesting. Located at an altitude of 2,472 metres 8,110 feet above sea level, it lies in a circle of mountains whose highest peaks are Mont Blanc and the Great Combin. To the north it is dominated by the Chenalette. 2,888 metres9,475 feet and to the south by the Mont-Mort. 2866 metres9.403 feet. The Hospice is built at the highest point of the Pass where the Swiss Entremont and the Italian Buthier valleys meet. The orientation of the Pass is northeast-southwest, and it is this geographical position, together with the prevailing winds in this part of the Alps, which make living conditions extremely uncomfortable during the winter months, when the temperature drops as low as 30 C° below zero. Even on the hottest days of summer it rarely reaches more than about 20 C°. Winter snowfall averages 20 metres 65 feet and sometimes even more. During the past 55 years it has been calculated that the lake there has been frozen on an average of 265 days each year. For some 8-9 months of the year the top of the Pass is covered with snow. There is some snowfall every single month of the year, and in wet summers it has been known for snow to fall every week, Weather in this part of the Alps is very variable : the sky may be beautifully clear in the morning with every indication of continued fine weather when the Canons set out to meet travellers. Yet before they return in the evening, conditions may have changed entirely ; snow may be falling or a thick fog may have enveloped both the Hospice and the Pass. After the comments on weather conditions, one would assume that the Great St. Bernard is a dead region, devoid of any plant life. This is a false assumption since during the short summer months — June to September — the entire mountainside is clothed with a magnificent blanket of flowers. This is due to its location among the very varied primary and secondary rock formations, particularly in the parts that face south and are exposed to the sun. An expert botanist has distinguished over 1,200 varieties of plants, some of which are extremely rare. Among the most common animals and birds are the hare, the snow chaffinch and several others with local names. The hare and the local “arbene” or ptarmigan have the remarkable faculty of changing their coats to blend with the surrounding landscape. The eagle, the chamois and the fox have also been seen at times around the Great St. Bernard, particularly in April and October. Objects found in the valleys on both sides of the Monastery bear witness to the fact that the Pass has been used by travellers as far back as the Bronze Age — about 800 B.C. It is known also that around 388 RC. the Lingon and Boien peoples of the rich lands of Burgundy and Langres travelled ever the Pass en their way to Italy<. The same route was used by the soldiers of Brennus (the (Gallic chieftain who invaded Rome to defeat the Romans in 390 B.C. ; and later by the Gesates, a Celtic people who inhabited the Alps and the banks of the Rhone>. Whether Hannibal and his army took this route en their way to defeat the Romans in 217 RC. is open to doubt, other nearby passes being more suitable for this kind of exploit. Long before Roman Legions had conquered the PenninePass” Great St. Bernard Pass, Roman merchants trading with the Gauls knew of it. This has been proved by the discovery of coins in the region of the small plateau to the west of the lake. The pagan inhabitants of the probably worshipped Penn (Poenin) as their god. In order to subdue the Rhone Valley and the Pennine Pass,” where merchants were ever being held to ransom”, Julius Caesar made his first attack in 57 B.C., when Sergius Galba took possession of Octodurus (Martigny) with the 12th Legion and a company of calvary. Some 40 years later, the Roman Army occupied the whole of the Pennine ValleyCanton of Valais). Around the year 12 B.C., Augustus built a road across the Alps to ink Augusta Praetoria (Aosta) with Octodurus (Martigny). He then continued in the direction of Tarnaiae. (St. Maurice), Vevey, Aventicum (Avenches), Salodurum (Soleure) and as far as Augusta Raurica Basel. Beside the church in Bourg St.Pierre is a milestone which dates from the time or Constantine the Great, and marks the XX1Vth mile from Forum Claudii Vallensium. now known as Martigny. Traces of this Roman road can still he seen in the Valley. On the spot where the Monastery now stands, the Romans had erected a temple to their supreme deity and a refuge nearby for the imperia ! envoys and legionaries. From this temple, whose foundations can still be seen, the pass took the name of Mons Iovis or MountJupiterMont Joux). This altar to the God of Thunder was undoubtedly destroyed during the reign of Theodosius and the refuge was pulled down during the Barbarian invasions. A considerable number of Roman coins have been found (more than 2,000), a lance, ornaments, bronze statuettes and a number of interesting ex-votos (votive offerings)*. Towards the end of November A.D. 753, Pope Stephan II crossed with a large retinue 011 his way to meet King Pepin the Short of France (father of Charlemagne) to seek his aid against the Lombards. Charlemagne also despatched an army by this route in AD. 799 under the command of his uncle Bernard, while he himself crossed by another pass, leading a second army. 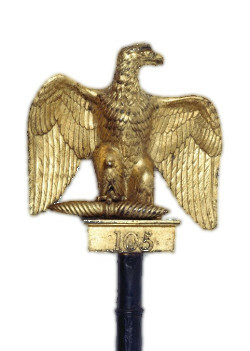 A bronze eagle (perhaps from a legionary standard) is now in London (British Museum). The following year the Emperor Charlemagne, after his coronation In Milan, returned to his own kingdom via Mont Joux. 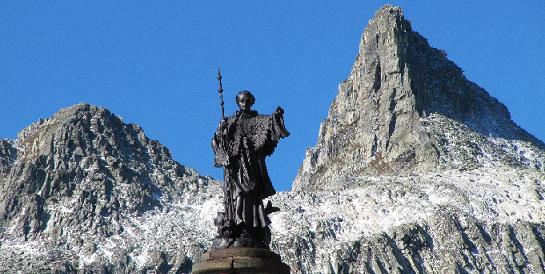 Pope Adrian I sought assistance from this powerful monarch, asking him to give protection to the hospices which had been built by Christian charity along the Alpine road, “so that the monks who dwell there may continue to serve God by prayer and giving aid to pilgrims”. At some time there must have been a refuge on this narrow passage through the Alps which was dependent on the Abbey of Bourg St. Pierre. During the first half of the 10th century hordes of Hungarians and Saracens invaded the Valley of Aosta and the Valais, leaving death and destruction in their wake. They destroyed the Abbey Church of Bourg St. Pierre and set lire to the Abbey of St. Maurice in AD. 940. Shortly after he became King of Italy. Count Hugh of Provence entrusted guardianship of the passes through the Alps to the Saracens in order to prevent his rival, King Berengarius, from entering the Peninsula. Once they became masters of Mont Joux, these enemies of Christianity began worship of their own idolatrous gods, bringing terror and often death to travellers on this narrow mountain road. Sr. Mayeul was taken prisoner in AD. 972 at Orsieres, and it was only after the Abbot of Cluny paid a ransom of one thousand silver pounds that he was set free. in AD. 1020 an army on its way from Normandy found the Pass was barred to the west of Lak Pennin. It was here that the “Ostiolum mentioned by Sr. Gregory of Tours was located, a narrow defile through which travellers were allowed to pass only after being relieved” of large sums of money. On learning of the great dangers facing pilgrims crossing the Pennine Alps, Canute, King of Denmark. resolved to plead their cause at the Court of Rudolf 111, King of the Two Burgundies. Canute was in Rome at the same time as Rudolf, and was therefore able to make his plea in the presence of the Pope as well on behalf of those who crossed at such peril. Rudolf promised that order would be restored. it was, however, Divine Providence which decided upon whom the task of ridding Mon Joux of these brigands and the safekeeping of pilgrims and travellers on this narrow Pass should fail... Saint Bernard of Menthon.